Searching for a romantic riverside getaway for you and someone special? 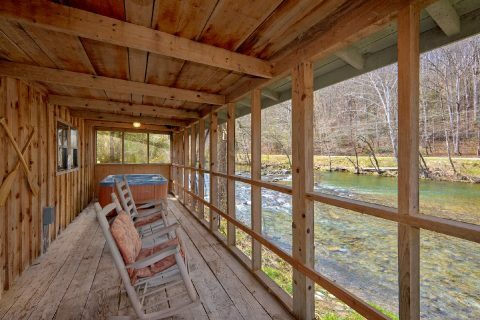 Look no further than "River Cabin," a beautiful honeymoon cabin in the scenic Richardson Cove area of the Smoky Mountains! 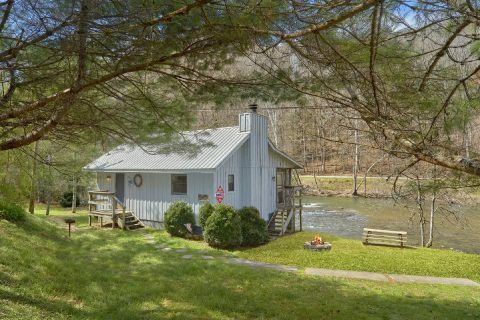 Not only does this cabin provide guests with a peaceful spot on the river, but it even boasts a screened-in back porch complete with a hot tub, so you can truly enjoy the sights and sounds of nature that surround this cabin. 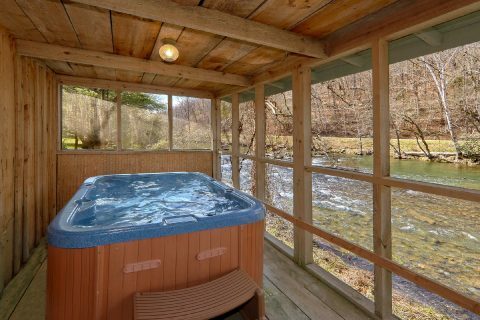 When you aren't busy relaxing at this peaceful getaway on a Smoky Mountain river, you'll love exploring the best the Smokies can offer. Since Pigeon Forge, TN is less than 10 miles away; you can easily access dozens of exciting attractions, shops, and restaurants. 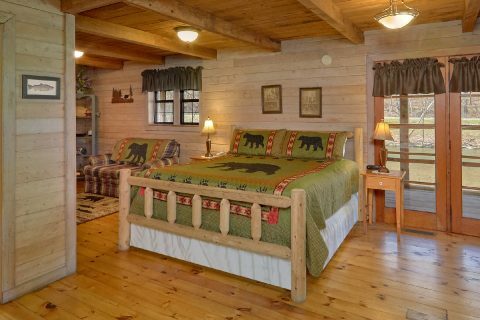 Additionally, this cabin is only a short drive from Foxfire Mountain Adventure Park, an outdoor adventure attraction complete with zip lines, a rock climbing wall, a ropes course, ATV tours, and more! 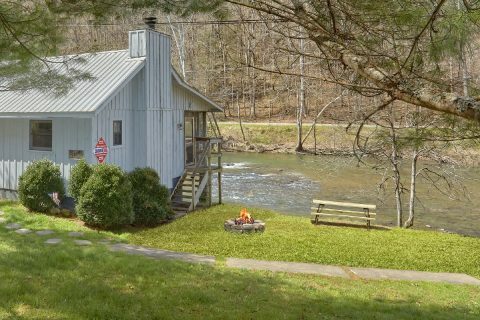 After you return to "River Cabin" after a great day spent exploring the Smoky Mountains of Tennessee, you'll love unwinding at this cozy cabin with a lovely riverside vacation. 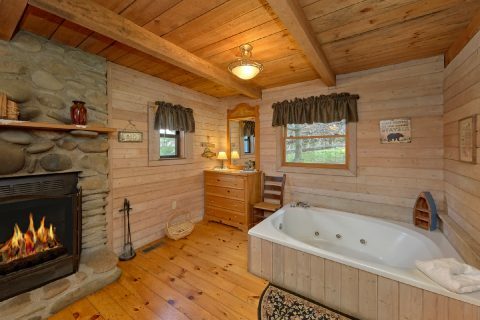 On your cabin's screened-in back deck, you'll love resting your weary bones in the warm waters of the hot tub. This deck area even boasts a nice, private view that overlooks the river. In your cabin's living room area, you can have a laid-back movie night. With your cabin's outdoor fire pit, you can enjoy a nice evening under the stars by the fireside with your friends and family. Once you retire to the bedroom, you can stoke a fire in the warm, wood-burning fireplace to create a romantic atmosphere. This area also provides a king-size bed, an in-room jacuzzi tub, and a full bathroom. 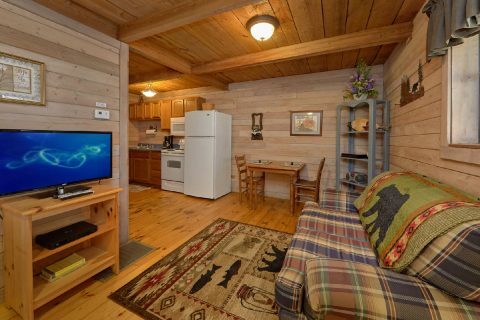 Altogether, this cozy cabin sleeps up to 2 guests in comfort, so it's ideal for an affordable honeymoon or a romantic couple's vacation in the Smokies. 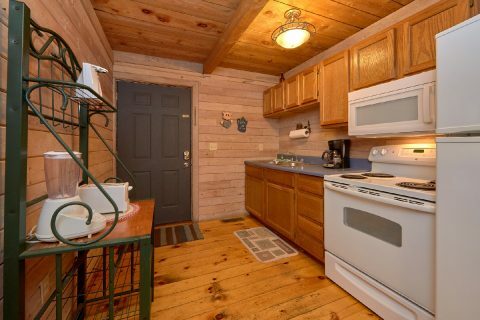 Lastly, while your cabin is only a short drive from lots of great dining options, "River Cabin" also provides a full kitchen and charcoal grill for you to use during your stay. 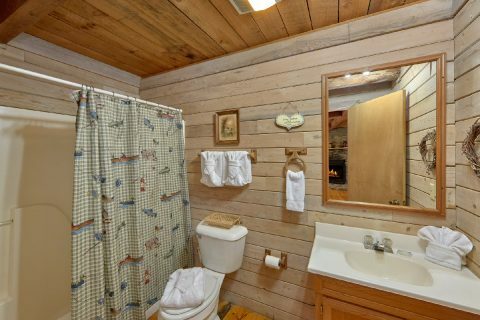 Book this affordable cabin for couples today with Cabins USA to save 15% on your nightly rate with our special cabin discount!